It is recommended that Paediatric First Aiders undertake annual refresher training to practise their skills and update their knowledge on the latest first aid procedures. 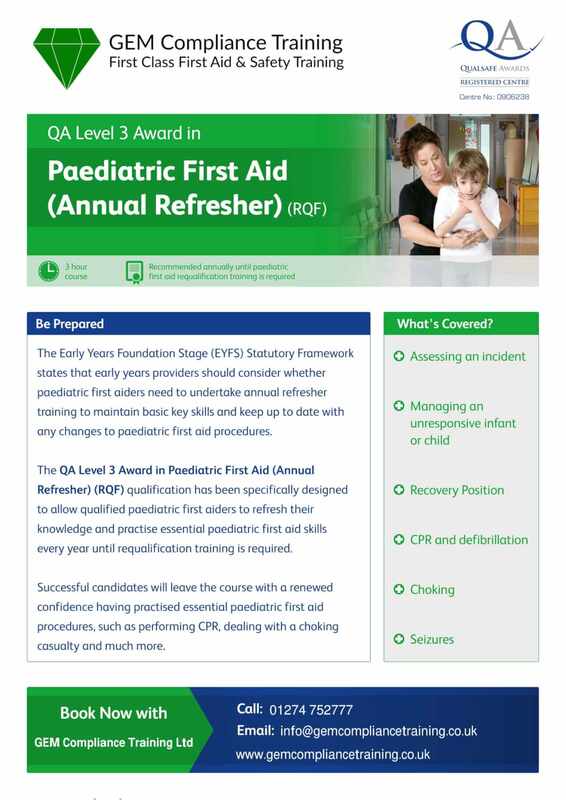 Our 3 hour Paediatric First Aid Annual Update is specifically designed to allow qualified Paediatric First Aiders to update their first aid skills yearly, until requalification training is required. Successful candidates will leave with a renewed confidence, having had the opportunity to practise essential first aid procedures, as well as learn the latest techniques needed to deal with an emergency situation. We have regular Paediatric First Aid Annual Refresher public courses coming up taking place at our training venues in Bradford and Bingley open to anybody wishing to book a place or places for a group. To view all our Paediatric First Aid public courses coming up click on the ‘Book here’ button below and you will be taken to our course booking page. Alternatively, we can arrange to deliver our Paediatric First Aid Annual Refresher course onsite in your setting to groups. Courses delivered in your setting can be delivered during business hours or on evenings and weekends to suit your needs. We pride ourselves on our flexible approach in meeting our client’s needs. We can run a single course with a maximum of 12 delegates for this particular course with one of our trainers. Bespoke training packages can be provided and we can offer discounts on block bookings.